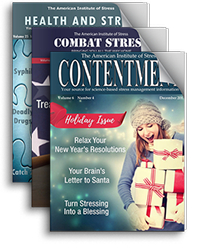 The essays and articles found here cover a variety of stress topics. These items posted here will rotate into the archives on a regular basis. For more in depth reading on these and other stress topics log in and visit our archives. Kirsch, Daniel L. and Nichols, Francine. Psychiatric Clinics of North America, 36(1):169-176, 2013. Click to download PDF[/toggle] [toggle title=”Soaring Stress in Lawyers”]Except for fictional TV heroes like Perry Mason and Ben Matlock, most people view lawyers as a significant source of stress. Some who despise them might even second Shakespeare’s suggestion in Henry VI (Part 2), “The first thing we do, let’s kill all the lawyers”. But lawyers are themselves experiencing increased stress as indicated by statistics showing that as many as one in four complain of suffering from stress. Out of 105 occupations, lawyers rank first in depression, their rate of alcohol abuse is 18% vs. 10% nationwide, there is a disproportionate increase in drug addiction and suicide and female lawyers working more than 45 hrs/week are three times more likely to have miscarriages than those working less than 35 hours. In addition to overwork, being a lawyer is stressful because of having the responsibility for other people, their money, family, or freedom, a high public expectation of performance and standards coupled with lower public tolerance or understanding, the increased adversarial nature of other lawyers, greater competition for clients, undertaking more work than can be handled, accepting cases outside an area of expertise due to complex and constantly changing legal precedents as well as assignments that are uninteresting or monotonous in order to survive financially. These and other factors can cause the sensation of being physically and emotionally drained, feelings of helplessness, hopelessness, anxiety, guilt, shame or paranoia, and a negative attitude toward work, other people or life in general. In other instances there may be a sense of omnipotence or indispensability that makes it difficult to cut back on workload or responsibilities. As a consequence, colleagues, staff, clients and adversaries are treated in a detached, dehumanizing fashion, there are frequent unscheduled absences from work, missed deadlines, delays in important meetings, increased marital or family conflicts and loss of contact with close friends, compulsive behaviors such as overeating, overspending, engaging in substance abuse and problems sleeping. A number of groups have been formed to provide advice and relief. The American Bar Association has had a yearly meeting devoted to this for two decades that is now a full four-day conference. Brochure for American Bar Association 19th National Conference on Lawyer Assistance Programs October 24-27, 2006, Health And Stress Newsletter #8, 1997[/toggle] [toggle title=”Can supplements help you lose weight by reducing cortisol and stress?”]Almost everyone who watches television knows that stress causes beer bellies because of commercials for Cortislim, Relacore, and other weight loss supplements that claim to reduce stress by lowering cortisol. The U.S. and New Zealand are the only two countries that allow such direct to consumer advertising and while all drugs must back up their claims and list side effects there is little or no control over nutritional supplements. Relacore ads ask “Is Stress Making You Fat? Excess tummy flab is not your fault! Relacore is the solution to excess abdominal fat and stress reduction!” Numerous other products have jumped on the stress-weight gain bandwagon and some of their assertions are even more ludicrous. Relacore also exhibits “excellent stress management abilities without sedation” that are comparable to Valium and in addition to lowering cortisol, it allegedly boosts DHEA. TheraStress is “the most scientifically advanced stress reducing, fatigue fighting, fat reducing, health enhancing natural product available.” It contains “adaptogens”, exotic oriental herbs that “stimulate the body’s own regenerative process” and “balance the secretions of the adrenal cortex.” All this from just 20-40 drops in a glass of water once a day. CortaLean, the “Most Advanced Stress Reducing — Weight Loss Formula Ever Created” similarly” suppresses appetite, boosts metabolism, melts abdominal fat away and blocks cortisol levels induced by stress. Its superiority comes from high amounts of vitamin B complex that “could save 300,000 lives a year from heart attacks” according to an American Medical Association article journal that was not pertinent. Citing irrelevant articles from respected journals to provide a patina of authenticity is a common deceptive practice used by these supplements to confuse consumers. After all, what could be better than a pill that will help you lose weight, lower stress and live longer that is supported by solid scientific studies? However, there are no supplements that do any of these things. As noted in past Newsletters, numerous studies do confirm that cortisol as well as stress can increase the deposition of deep abdominal fat. The importance of this observation will be discussed in the next Stress Bulletin. References: Health And Stress Newsletter #6 2000, # 5 2003, #5 2004[/toggle] [toggle title=”Stress and Irritable Bowel Syndrome”]Irritable Bowel Syndrome (IBS) is a common and painful disorder with a wide range of symptoms that can include intermittent or persistent abdominal pain, cramping, bloating, diarrhea or constipation. The condition is surprisingly common, with official estimates suggesting that 1 in 5 adult Americans will suffer one or more IBS symptoms at some time in their lives. Many feel that the incidence is higher since although IBS is the most frequent diagnosis that gastroenterologists make, many patients have symptoms but don’t complain or seek medical help. Most people can control symptoms with a combination of diet, medications and stress management. However, these vary and treatment programs that are effective for some patients may not improve others. A recent report from Kings College, London, also noted that many conventional drugs often provide minimal or no relief. “Symptoms of irritable bowel syndrome are similar to those found in depression, so things that work for depression work for it. Patients with IBS are not depressed, but the treatments work.” It was suggested that in many IBS sufferers, the problem is due to an exaggerated response of the brain and central nervous system to normal gastrointestinal sensations and stimuli, as well as to emotional stress. Support comes from studies showing that certain stress reduction strategies such as cognitive behavioral interventions and hypnotherapy can provide very significant benefits in most patients, especially for those with severe symptoms. These approaches focus on how patients perceive their symptoms, rather than the symptoms themselves. They also emphasize that IBS patients don’t necessarily have a psychological problem, but rather a behavioral pattern that makes them more ulnerable to developing symptoms, as well as overreacting to them. According to one of the authors, “Patients with irritable bowel syndrome should be made aware of the existence of these treatments so that they can make informed choices. Specifically, they should be made aware that using a psychological treatment does not mean that the disease is ‘all in the mind'”. He found that one of the most effective treatments for IBS were so-called “talking therapies”, such as cognitive behavioral interventions. As another author explained, “That’s a general term for a set of psychotherapies based on the belief that changing the way a person thinks about a condition can bring about improvement, even if the condition does not change. In a condition with such a wide range of symptoms, treatment must be tailored to the individual patient. In general, people who are more open to the idea of therapy will do better”. In commenting on the article, a specialist from Mount Sinai Medical Center in New York, explained, ” IBS is a case of “brain-gut interaction. There is a ‘big brain’ in the skull and a ‘little brain’ in the gut. Either you have too much information going up or too much information going down.” She also emphasized that treatment requires intensive doctor-patient discussions to reinforce that IBS is not a psychological disease per se but rather a hyperactive brain-gut reaction that can be toned down to attenuate symptoms. Ref: Hayee B, Forgacs I. Psychological approach to managing irritable bowel syndrome. BMJ, May 2007; 334: 1105–1109. Causes, symptoms and treatments for IBS are described in detail by the U.S. National Digestive Diseases Information Clearinghouse and can be found at http://digestive.niddk.nih.gov/ [/toggle] [toggle title=”Stress, GERD and the new Halo treatment”]People respond to stress differently and for some, the GI tract can take center stage. Stress can affect the gut by involuntary nervous system influences that disrupt normal motility patterns and the secretion of enzymes and hydrochloric acid as well as stimulating the production of anti-inflammatory hormones like cortisol that produce ulcerations. It makes me “sick to my stomach” or gives me”agita” are common complaints and in addition to nausea and heartburn, others may experience abdominal pain, bloating, cramps or diarrhea. While these symptoms are usually transient and not disabling, repeatedly invoked, it is not hard to understand why stress might cause esophagitis, peptic ulcer, irritable bowel disease as well as ileitis and ulcerative colitis. Conversely, these diseases are also sources of stress and in many instances, it can be difficult to determine which came first. similar complications are worse in older individuals with osteoporosis, possibly because blocking stomach acid interferes with the absorption of calcium. is necessary and the procedure seems to be well tolerated with few adverse side effects and most patients can return to their normal activities within 2 hrs. 1-year follow-up of 100 patients. Gastrointest Endosc 2007; 65: 185-195. O’Connor A. Chewing Gum After A Meal Can Prevent Heartburn. New York Times, 7/31/07. [/toggle] [toggle title=”Stress, Suicide and Female Physicians”]Physicians are more likely to commit suicide than the general public, as well as those in other professions. While this tendency was noted 150 years ago in A Manual of Psychological Medicine, the problem has become more prevalent. This has generally been attributed to the increased stresses doctors are now subjected to, including: Practice pressures and demands that leave little time to attend to family or personal needs, Government regulations that are increasingly restrictive, Third party intrusions and interference, Increase in malpractice litigation and insurance costs, Pressure to practice defensive medicine, Erosion of the doctor-patient relationship, Diminished public image of physicians, Fear of serious injury from a violent patient or protest group, Managing the business aspects of medical practice in a climate of decreasing compensation at the same time expenses continue to escalate, Lack of access to support systems. It is estimated that three times as many physicians take their own lives compared to the population at large. Up to 130 commit suicide each year, which is about the size of the Harvard Medical School graduating class.